ETA: is the terrorist group still active? Despite the discovery of an arsenal of weapons belonging to ETA in a field north of Paris, few believe the Basque terrorist group has the ability to resurrect its violent campaign. 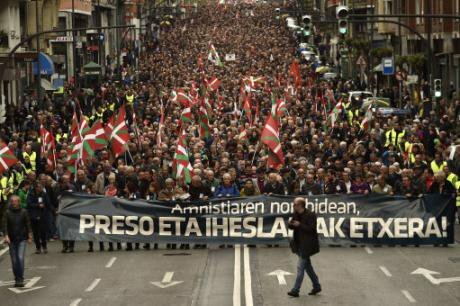 People wave Basque flags as thousands of pro independence Basques march demanding the return of all prisoners of ETA, in Bilbao, northern Spain, Sunday April 17, 2016. AP Photo/Alvaro Barrientos. All rights reserved. An important arsenal of shotguns, pistols and revolvers divided into four drums and buried in a forest north of Paris was found by the French police on 12 October, Spain’s national day. The arms cache belonged to ETA, the Basque terrorist group that ended its violent campaign for independence five years ago on 20 October 2011, but has so far refused to dissolve and decommission its weapons. ETA’s terrorist campaign lasted 43 years and claimed 845 lives, plus hundreds of displaced and injured people as well as an estimated cost of about 10 per cent of the Basque region’s GDP. According to sources of the investigation, ETA wanted to hand over the weapons in the presence of international mediators. It is alleged that the leadership of ETA wanted to negotiate the final disbandment of ETA before François Hollande’s term in office ends. Opinion polls suggest that the next French president will be conservative and unwilling to negotiate with a terrorist group. In the case of Spain, conservative PM Mariano Rajoy has also refused to end the dispersion policy for the 373 imprisoned etarras unless the Basque group disbands entirely. ETA’s window of opportunity to gain some concessions is practically closed, as authorities on both sides of the Pyrenees have little interest in providing ETA with a soft landing strip. ETA has not killed since March 2010 and a return to violence is dismissed by analysts. ETA sympathisers and Basque society at large have moved on and the number of people who support ETA is now marginal. An open engagement with ETA on the part of French and Spanish executives would legitimise indiscriminate violence and would ultimately confirm the view of those who think that terrorism is an effective ‘weapon of the weak’. But is this the end for the Basque insurgents? And is it true that ETA’s terrorist campaign was wholly ineffective? In a recent book on the rise and decline of ETA, we argue that the Basque group laid down its arms on 20 October 2011 after failing to achieve its strategic goal of creating an independent socialist state for the Basque homeland. Two key factors account for the end of ETA’s violent campaign and the adoption of peaceful means to pursue the secessionist goal: the efficiency of counter-terrorist policy and the loss of social support. The counter-terrorist policy brought the operational decline of ETA and de-legitimised its indiscriminate attacks. The key components of the security policy were the coordinated actions of the police and the courts, the international collaboration with France and the isolation of the political parties that sympathised with ETA. The main internal cause was the gradual loss of social support and the realisation by the leaders of ETA that terrorism, defined as the deliberate creation and exploitation of fear through violence of the threat of violence in the pursuit of political change, was ineffective in gaining policy concessions. Additional factors that account for the weakening of both ETA and radical Basque nationalism, the ideology and movement that supported the use of violence, were the backlash of public opinion and the post-9/11 international environment, when the fight against terrorism took a global shape. Ultimately, all these events triggered an internal debate about the usefulness of violence in obtaining policy concessions and its role in resolving territorial disputes. The idea that terrorism was counterproductive for the Basque secessionist movement was internalised by ETA sympathisers and helped trigger the process of internal deliberation in the 2000s. ETA supporters eventually confronted the question of whether terrorism works or not. True, terrorism was tactically useful in harming civilians, instilling fear and capturing the attention of an audience. But the indiscriminate targeting of civilians did not force the Spanish and French governments to make substantial policy concessions. The radical nationalist community that supported ETA came to the conclusion that terrorism was effective in obtaining tactical goals such as producing fear and harm but that it was completely ineffective politically. The Basque case is consistent with existing research on the effectiveness of terrorism that argues that political violence is generally an unsuccessful way for perpetrators to attain their demands. In fact, terrorism is an ineffective tactic for inducing government concessions and, as the current pro-sovereignty movement in Catalonia suggests, it is often the case that peaceful movements are more efficacious. It is beyond doubt that the counter-terrorist effort was the main cause for the end of ETA’s campaign. The coordinated actions of judges, prosecutors, police and intelligence services, not to mention the international campaign to isolate the group, reduced the membership of ETA to a handful of individuals who, in the words of a Minister of Interior, could ‘fit in a mini-bus’. However, the realisation that only a handful of terrorist groups in modern history have managed to accomplish their political aims also played its part. The time for public acts of decommissioning, peace processes and negotiation tables is over. ETA will not negotiate a comprehensive agreement with the Spanish and French governments and its inmates will have to take advantage of the opportunities of disengagement and reintegration that the law offers. The fact that the French authorities discovered the hidden store of 145 weapons last Wednesday indicates the extreme fragility of ETA as an organisation. The little attention devoted to the finding by domestic and international media outlets is also telling, as few believe the group has the ability (or even appetite) to restart its violent campaign. ETA’s network of supporters has been dwarfed and there is little doubt that radical Basque nationalism has finally transformed itself into a political movement where bullets have been definitely abandoned in favour of ballots.